How five certifications will change your Salesforce career! David’s note: This is a MUST read for anyone even thinking about getting certified – so many great things everyone (including me) can learn from your journey. Thank you for sharing and congrats on your success! So you don’t know me, but I happened to have been in the audience for a session of yours at Dreamforce 2014, and I absolutely loved what I heard. For the past 3 years I’ve been a Salesforce end user, then admin, then hack developer at my current job, learning whatever I needed as I needed it. After seeing you speak, I began using SFDC99 as my primary resource, learning to tweak my organization’s Apex and eventually write triggers of my own. Salesforce hasn’t been my primary role here, but it’s been one of my favorite things to work on. That said, I’d never really thought about certifications, as I’m very much a hacker-type, picking up whatever tools as I need them and adding them to my (somewhat chaotic) chest of tools for later use. Well, 2 months ago all of that changed. 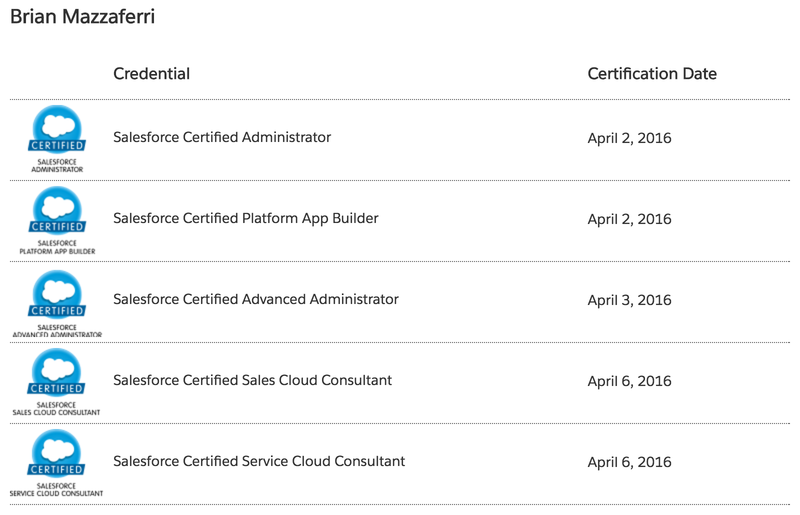 I was at Salesforce World Tour Chicago and saw a wonderful presentation by a woman working as an SFDC consultant, and I chatted her up afterwards, asking about what she did and the value of certifications. She was emphatic that certifications were absolutely worthwhile, and that they would skyrocket my value as a Salesforce professional. So, what did I do next? Well, of course I stopped by SFDC99, and immediately devoured all of the wonderful resources and success stories related to certs on your site, as well as charging through Trailhead to fill in the holes of all the pieces of the platform I don’t touch in my current org. I was inspired to say the least, especially with your point that the retakes are cheap enough that it’s very valuable to use the test itself as a study guide. If you have enough memory tricks to remember the questions you weren’t sure about (I like to use the memory palace myself), you can review those pieces of the platform afterwards and very strategically strengthen your knowledge base. So, 2 weeks later, I sat down and started charging through my certs, and within 5 days I had the core 5 knocked out! Once I had those certs posted on my LinkedIn, I immediately began receiving unsolicited inquiries from recruiters wanting to place me in new positions, and I was truly astounded at the power of the certifications and at the demand for Salesforce professionals in the marketplace. I’m now proud to say that I’ve accepted an offer to become a senior consultant in the customer experience practice of a wonderful consulting company, and I’m leaping headfirst into the world of Salesforce full time! I start my new job on Monday. So, long story short, I just wanted to say thank you for paying it forward, your work has helped me in gigantic ways, and I’m sure it will continue to do so in the future! Hey.. Many congratulations.. that was very inspiring.. I am new to salesforce and wanted to do these certificates. Can you please send me latest dumps and study material for all these five certifications. First of all congratulations Brain. Hi David how r you? i am appreciate your valuable response. Hey @Brian Congratulations on your new job!! Very inspiring story!! Very inspiring story indeed! Congrats on you all your new role @Brian. Wishing you all the best.